After the signing of the national Declaration of Independence, North Carolina’s Fifth Provincial Congress convened at Halifax to draft a state constitution. By December 18, 1776, both a declaration of rights and a constitution were adopted. Two days later, Richard Caswell, one of the heroes of the Battle of Moore’s Creek Bridge, was elected the first governor of the new state of North Carolina. A Declaration of Rights, &c"&c" is an abbreviation for "et cetera," a Latin expression that is used in English to mean "and other similar things" or "and so forth." . That all political power is vested in and derived from the people only. That no man or set of men are entitled to exclusive or separate emoluments or privileges from the community, but in consideration of public services. That the legislative, executive, and supreme judicial powers of government, ought to be forever separate and distinct from each other. That all powers of suspending laws, or the execution of laws, by any authority, without consent of the Representatives of the people, is injurious to their rights, and ought not to be exercised. That elections of members, to serve as Representatives in General Assembly, ought to be free. That, in all criminal prosecutions, every man has a right to be informed of the accusation against him, and to confront the accusers and witnesses with other testimony, and shall not be compelled to give evidence against himself. That no freeman shall be put to answer any criminal charge, but by indictment , presentment, or impeachment. That no freeman shall be convicted of any crime, but by the unanimous verdict of a jury of good and lawful men, in open court, as heretofore used. That excessive bail should not be required, nor excessive fines imposed, nor cruel or unusual punishments inflicted. That general warrants -- whereby an officer or messenger may he commanded to search suspected places, without evidence of the fact conmlittecl, or to seize any person or persons, not named, whose offences are not particularly described, and supported by evidence -- are dangerous to liberty, and ought not to be granted. That no freeman ought to be taken, imprisoned, or disseized of his freehold liberties or privileges, or outlawed, or exiled, or in any manner destroyed, or deprived of his life, liberty, or property, but by the law of the land. That every freeman, restrained of his liberty, is entitled to a remedy, to inquire into the lawfulness thereof, and to remove the same, if unlawful; and that such remedy ought not to be denied or delayed. That in all controversies at law, respecting property, the ancient mode of trial, by jury, is one of the best securities of the rights of the people, and ought to remain sacred and inviolable. That the freedom of the press is one of the great bulwarks of liberty, and therefore ought never to he restrained. That the people of this State ought not to be taxed, or made subject to the payment of any impost or duty, without the consent of themselves, or their Representatives in General Assembly, freely given. That the people have a right to assemble together, to consult for their common good, to instruct their Representatives, and to apply to the Legislature, for redress of grievances. That all men have a natural and unalienable right to worship Almighty God according to the dictates of their own consciences. That, for redress of grievances, and for amending and strengthening the laws, elections ought to be often held. That a frequent recurrence to fundamental principles is absolutely necessary, to preserve the blessings of liberty. That no hereditary emoluments, privileges or honors ought to be granted or conferred in this State. That perpetuities and monopolies are contrary to the genius of a free State, and ought not to be allowed. That retrospective laws, punishing facts committed before the existence of such laws, and by them only declared criminal, are oppressive, unjust, and incompatible with liberty; wherefore no ex post facto law ought to be made. The property of the soil, in a free government, being one of the essential rights of the collective body of the people, it is necessary, in order to avoid future disputes, that the limits of the State should be ascertained with precision; and as the former temporary line between North and South Carolina, was confirmed, and extended by Commissioners, appointed by the Legislatures of the two States, agreeable to the order of the late King George the Second, in Council, that line, and that only, should be esteemed the southern boundary of this State as follows: that is to say, beginning on the sea side, at a cedar stake, at or near the mouth of Little River (being the southern extremity of Brunswick county) and running from thence a northwest course, through the boundary house, which stands in thirty-three degrees fifty-six minutes, to thirty-five degrees north latitude; and from thence a west course so far as is mentioned in the Charter of King Charles the Second, to the late Proprietors of Carolina. Therefore all the territories, seas, waters, and harbours, with their appurtenances, lying between the line above described, and the southern line of the State of Virginia, which begins on the sea shore, in thirty-six degrees thirty minutes, north latitude, and from thence runs west, agreeable to the said Charter of King Charles, are the right and property of the people of this State, to be held by them in sovereignty; any partial line, without the consent of the Legislature of this State, at any time thereafter directed, or laid out, in anywise notwithstanding: -- Provided always, That this Declaration of Rights shall not prejudice any nation or nations of Indians, from enjoying such hunting-grounds as may have been, or hereafter shall be, secured to them by any former or future Legislature of this State: -- And provided also, That it shall not be construed so as to prevent the establishment of one or more governments westward of this State, by consent of the Legislature: -- And provided further, That nothing herein contained shall affect the titles or repossessions of individuals holding or claiming under the laws heretofore in force, or grants heretofore made by the late King George the Second, or his predecessors, or the late lords proprietors, or any of them. The Constitution, or Form of Government, &c"&c" is an abbreviation for "et cetera," a Latin expression that is used in English to mean "and other similar things" or "and so forth." That the legislative authority shall be vested in two distinct branches both dependent on the people, to wit, a Senate and House of Commons. That the Senate shall be composed of Representatives annually chosen by ballot, one for each county in the State. That the House of Commons shall be composed of Representatives annually chosen by ballot, two for each county and one for each of the towns of Edentown, Newbern, Wilmington, Salisbury, Hillsborough and Halifax. That the Senate and House of Commons, assembled for the purpose of legislation, shall be denominated, The General Assembly. That each member of the Senate shall have usually resided in the county in which he is chosen for one year immediately preceding his election, and for the same time shall have possessed, and continue to possess in the county which he represents, not less than three hundred acres of land in fee. That each member of the House of Commons shall have usually resided in the county in which he is chosen for one year immediatelv preceding his election, and for six months shall have possessed, and continue to possess, in the county which he represents, not less than one hundred acres of land in fee, or for the term of his own life. That all freemen, of the age of twenty-one years, who have been inhabitants of any one county within the State twelve months immediately preceding the day of any election and possessed of a freehold within the same county of fifty acres of land for six months next before, and at the day of election, shall be entitled to vote for a member of the Senate. That all freemen of the age of twenty-one Years, who have been inhabitants of any one county within this State twelve months immediately preceding the day of any election, and shall have paid public taxes shall be entitled to vote for members of the House of Commons for the county in which he resides. That all persons possessed of a freehold in any town in this State, having a right of representation and also all freemen who have been inhabitants of any such town twelve mouths next before and at the day of election, and shall have paid public taxes, shall be entitled to vote for a member to represent such town in the House of Commons: -- Provided always, That this section shall not entitle any inhabitant of such town to vote for members of the House of Commons, for the county in which he may reside, nor any freeholder in such county, who resides without or beyond the limits of such town, to vote for a member for said town. That the Senate and House of Commons, when met, shall each have power to choose a speaker and other their officers; be judges of the qualifications and elections of their members; sit upon their own adjournments from day to day, and prepare bills, to be passed into laws. The two Houses shall direct writs of election for supplying intermediate vacancies; and shall also jointly, by ballot, adjourn themselves to any future day and place. That all bills shall be read three times in each House, before they pass into laws, and be signed by the Speakers of both Houses. That every person, who shall be chosen a member of the Senate or House of Commons, or appointed to any office or place of trust, before taking his seat, or entering upon the execution of his office, shall take an oath to the State; and all officers shall also take an oath of office. That the General Assembly shall, by joint ballot of both houses, appoint Judges of the Supreme Courts of Law and Equity, Judges of Admiralty, and Attorney-General, who shall be commissioned by the Governor, and hold their offices during good behavior. That the Senate and House of Commons shall have power to appoint the generals and field-officers of the militia, and all officers of the regular army of this State. That the Senate and House of Commons, jointly at their first meeting after each annual election, shall by ballot elect a Governor for one year, who shall not be eligible to that office longer than three years, in six successive years. That no person, under thirty years of age, and who has not been a resident in this State above five years, and having, in the State, a freehold in lands and tenements above the value of one thousand pounds, shall be eligible as a Governor. That the Senate and House of Commons, jointly, at their first meeting after each annual election, shall by ballot elect seven persons to be a Council of State for one year, who shall advise the Governor in the execution of his office; 2 nd that four members shall be a quorum; their advice and proceedings shall be Altered in a journal, to be kept for that purpose only and signed,by the members present; to any part of which, any member present may enter his dissent. And such journal shall he laid before the General Assembly when called for by them. That there shall be a seal of this State, which shall be kept by the Governor, and used by him, as occasion may require; and shall be called, The Great Seal of the State of North Carolina, and be affixed to all grants and commissions. The Governor. for the time being, shall be captain-general and commander in chief of the militia; and, in the recess of the General Assembly, shall have power, by and with the advice of the Council of State, to embody the militia for the public safety. That the Governor, for the time beings shall have power to draw for and apply such sums of money as shall be voted by the general assembly, for the contingencies of government, and be accountable to them for the same. He also may, by and with the advice of the Council of State, lay embargoes, or prohibit the exportation of any commodity, for any term not exceeding thirty days, at any one time in the recess of the General Assmably; and shall have the power of granting pardons and reprieves, except where the prosecution shall be carried on by the General Assembly, or the law shall otherwise direct; in which case he may in the recess grant a reprieve until the next sitting of the General Assembly; and may exercise all the other executive powers of government, limited and restrained as by this Constitution is mentioned, and according to the laws of the State. And on his death, inability, or absence from the State, the Speaker of the Senate for the time being -- (and in case of his death, inability, or absence from the State, the Speaker of the House of Commons) shall exercise the powers of government after such death, or during such absence or inability of the Governor (or Speaker of the Senate,) or until a new nomination is made by the General Assembly. That the Governor, Judges of the Supreme Court of Law and Equity, Judges of Admiralty, and Attorney-General, shall have adequate salaries during their continuance in office. That the General Assembly shall, by joint ballot of both Houses, annually appoint a Treasurer or Treasurers for this State. That the Governor, and other officers, offending against the State, by violating any part of this Constitution, mal-administration, or corruption, may be prosecuted, on the impeachment of the General Assembly, or presentment of the Grand Jury of any court of supreme jurisdiction in this State. That the General Assembly shall, by joint ballot of both Houses, triennially appoint a Secretary for this State. That no persons, who heretofore have been, or hereafter may be, receivers of public the monies, shall have a seat in either House of General Assembly, or be eligible to any office in this State, until such person shall have fully accounted for and paid into the treasury all sums for which they may he accountable and liable. That no Treasurer shall have a seat, either in the Senate, House of Commons, or Council of State, during his continuance in that office, or before he shall have finally settled his accounts with the public, for all the monies which may be in his hands at the expiration of his office belonging to the State, and hath paid the same into the hands of the succeeding Treasurer. That no officer in the regular army or navy, in the service and pay of the United States, of this or any other State, nor any contractor or agent for supplying such army or navy with clothing or provisions, shall have a seat either in the Senate, House of Commons, or Council of State, or be eligible thereto: and any member of the Senate, House of Commons, or Council of State, being appointed to and accepting of such office, shall thereby vacate his seat. That no member of the Council of State shall have a seat, either in the Senate, or House of Commons. That no Judge of the Supreme Court of Law or Equity, or Judge of Admiralty, shall have a seat in the Senate, House of Commons, or Council of State. That no Secretary of this State, Attorney-General, or Clerk of any Court of Record, shall have a seat in the Senate, House of Commons, or Council of State. That the Justices of the Peace, within their respective counties in this State, shall in future be recommended to the Governor for the time being, by the Representatives in General Assembly; and the Governor shall commission them accordingly: and the Justices, when so commissioned, shall hold their offices during good behaviour, and shall not be removed from office by the General Assembly, unless for misbehaviour, absence, or inability. That there shall be no establishment of any one religious church or denomination in this State, in preference to any other; neither shall any person, on any presence whatsoever, be compelled to attend any place of worship contrary to his own faith or judgment, nor be obliged to pay, for the purchase of any glebe, or the building of any house of worship, or for the maintenance of any minister or ministry, contrary to what he believes right, of has voluntarily and personally engaged to perform; but all persons shall be at liberty to exercise their own mode of worship: -- Provided, That nothing herein contained shall be construed to exempt preachers of treasonable or seditious discourses, from legal trial and punishment. That no person in the State shall hold mole than one lucrative office, at any one time: -- Provided, That no appointment in the militia, or the office of a Justice of the Peace, shall be considered as a lucrative office. That all commissions aml grants shall run in the name of the State of North Carolina, and bear test, and be signed by the Governor. All writs shall run in the same manner and bear test, and be signed by the Clerks of the respective Courts. Indictments shall conclude, Against the peace and dignity of the estate. That the Delegates for this State, to the Continental Congress while necessary, shall be chosen annually by the General Assembly, by ballot; but may be superseded, in the mean time, in the same manner; and no person shall be electoral, to serve in that capacity, for more than three years successively. That there shall be a Sheriff, Coroner or Coroners, and Constables, in each county within this State. That the person of a debtor, where there is not a strong presumption of fraud, shall not be continued in prison, after delivering up, bona fide, all his estate real and personal, for the use of his creditors in such manner as shall be hereafter regulated by law. All prisoners shall be bailable by sufficient sureties, unless for capital offences when the proof is evident or the presumption great. That every foreigner, who comes to settle in this State having first taken an oath of allegiance to the same, may purchase, or, by other means, acquire, hold, and transfer land, or other real estate; and after one year's residence, shall be deemed a free citizen. That no purchase of lands shall be made of the Indian natives, but on behalf of the public, by authority of the General Assembly. That the future Legislature of this State shall regulate entails, in such a manner as to prevent perpetuities. That the Declaration of Rights is hereby declared to be part of the Constitution of this State, and ought never to be violated, on any presence whatsoever. That any member of either House of General Assembly shall have liberty to dissent from, and protest against any act or resolve, which he may think injurious to the public, or any individual, and have the reasons of his dissent entered on the journals. That neither House of the General Assembly shall proceed upon public business, unless a majority of all the members of such House are actually present: and that, upon a motion made and seconded, the yeas and nays, upon any question, shall be taken and entered on the journals; and that the journals of the proceedings of both Houses of the General Assembly shall be printed, and made public, immediately after their adjournment. This Constitution is not intended to preclude the present Congress from making a temporary provision, for the well ordering of this State, until the General Assembly shall establish government, agreeable to the mode herein before described. December the eighteenth, one thousand seven hundred and seventy-six, read the third time, and ratified in open Congress. Philadelphia: Printed by F. Bailey, in Market-Street. 1779. The Constitution (North Carolina). Documenting the American South. University Library, The University of North Carolina at Chapel Hill. http://docsouth.unc.edu/unc/uncbk1017/title.html. North Carolina Digital Collections. 1776. The Constitution (North Carolina). http://digital.ncdcr.gov/cdm/ref/collection/p16062coll32/id/22. 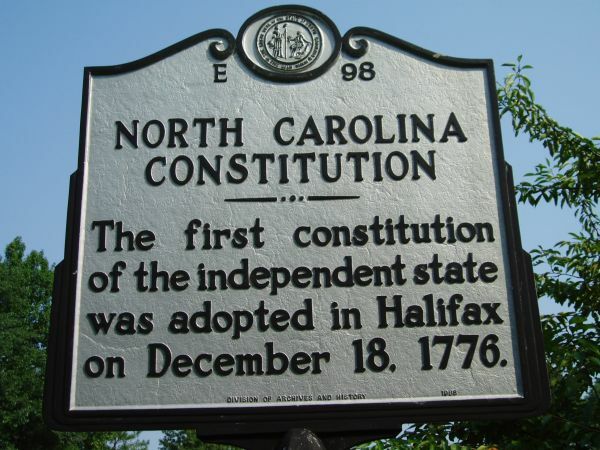 The Fifth Provincial Congress met at Halifax in December 1776 to write North Carolina’s first state constitution.